For nearly 40 years, Chemistry in the Laboratory has been meeting the needs of teachers and students. 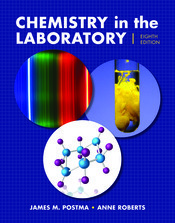 This new edition builds on that legacy while addressing cutting-edge trends in the chemistry laboratory—including forensic chemistry and environmental and green chemistry. As always, the new edition of Chemistry in the Laboratory offers precise, easy-to-follow instructions, helpful illustrations, and an emphasis throughout on laboratory safety. Again, throughout, a Consider This feature encourages users to expand the principles of the experiment into interesting applications, open-ended experiments, or unexplored corners. Most experiments in the manual can be completed in one lab session, but some can be linked or extended for a multi-lab project.